﻿ Ask us a question about your next tailoring/ Alteration needs! Ever purchase a new pair of shoes and know exactly what shoe size you are? 9, 10, 12 & 1/2. Well same thing goes for clothing when shopping for yourself, a friend, or significant other it’s best to know your measurements before purchasing a piece of garment. Yes, we are trying to help you save money! So next time you purchase a suit jacket or those fancy pair of jeans think about your measurements and where they sit on your body to avoid excessive alterations. At Cheung’s Tailor Alterations we provide custom measurements for your next custom tailored suits, dress, wedding gowns, shirts, pants anything you can think of we will do our best to. Posture and build: Achieving a good fit is not just about your garment’s measurements. It’s about the proportions. Each body type is different and your posture may change over time. Weather you like a style to be shorter, longer, or in the middle is the matter of preference and alterations but things do change such as height and weight. The above is just a small example of different types of measurements Cheung’s Tailor Alterations performs. For specific alterations you may bring in your own sheet for measurements. Pricing does vary per client specifications. But you may already know by now, consultations are free! At Cheung’s Tailor Alterations we require 100% deposit for all tailoring and alterations before any work may be performed. We require cash only on all rush orders. At Cheung’s Tailor Alterations we believe that small and large businesses can do their part no matter how small and how large. So as a local small business over time we have continually to work with our community and see how we are able to help. It began over 8 years ago since our client first brought in a bag of hangers and asked if we recycled. We were shocked and took in those hangers. Generally they’re perfect some a little bent, but we give them a quick wipe and we’ve recycled some metal, wood, or plastic. So at Cheung’s Tailor we gladly accept the following types of hangers. It’s fairly simple just let us know you’d like to recycle your hangers and drop it off. Our philanthropy is generally held during the holiday season between December and January. To continue and help these great organization please click the links above or email us at [email protected] and we can direct you to the right individuals. Most clients who need something fitted try on their clothing. For suit jackets needing tailoring please wear a shirt that you are most likely to wear with it. Dress alterations please wear the flats or heels that you would the night of the event. For custom alterations please bring in the accessories such as rhinestones, Swarovski crystals, ribbons etc. that you plan to have tailored to the piece of clothing. We may also help provide you with examples. Undergarments you plan on wearing generally with dresses. We do offer bust cups as well to be sewn in. Money. Cheung’s Tailor Alterations requires 100% prepaid on all tailoring. Please read here. Accessories such as Drapes and Curtains. ***For custom alterations we always suggest to customers to please provide materials to personal liking. Cheung’s Tailor Alterations can help with consulting on ideas. A client has once asked us, what don’t we provide. We also believe it would be an easier list to start with moving backwards since we provide a lot of services. Some times to something unique we have never done before. Our expert seamstress in Minnesota can do our best to help you with your next project. -Really really really thick leathers, boxed suit cases, undergarments, dyeing, embroidery, and most shoes. So far that’s all that came to mind. But please always ask there are new requests every week on neat items we can help tailor. Custom pillows: Client brought in 10 old sweaters with different festive holidays and wanted the our seamstress to create custom pillows with matching zipper colors for each of her grandchildren. Custom zipper: Client’s husband is on dialysis weekly, instead of removing his sweater at each visit due to the cold environment we help add a zipper in the right arm of his favorite sweater. Custom zipper and supporting sides: Client had a new Coach purse she really liked, over time the top would fold over and create an unwanted crease to her purse. Cheung’s Tailor help add support plastic to the side panels and also a new zipper for her wrist wallet. Cosplay Costumes: Every year we have had really unique Halloween costume alterations and custom cosplay costume alterations. Our latest was a Peter Pan and a Star Wars costume that would have been too hot to wear since it was all leather. Our client purchased regular workout sweats and we were able to harvest the original suit in various pieces to sew onto the sweats. There is a lot our seamstress can do, just ask. Please check out our services page for further services. ***Stories above do reflex real work performed recently. WHY CAN YOU NOT PROVIDE ME WITH THE ACTUAL PRICE? Because you would either be happy or unhappy when you come in. Expert seamstresses should never provide prices over the phone. This would be like diagnosing your car trouble without ever seeing or test driving it and giving you a price. Would you be comfortable with that? At Cheung’s Tailor Alterations our seamstresses offer free consultations for all your tailoring and alteration needs. We provide you with good ideas and pricing before you try it on. Just ask, we’re friendly :). To provide clients about pricing without ever seeing the garment would be irresponsible. So if you called or email us we can provide you with a ballpark price. A value for the work AND UP. This ensures that if you come in you would have a base line of what it could cost at least. It is never a definitive quote without seeing your needs for alterations. Please read here or below about our pricing on dresses to help understand why pricing cannot be given over the phone. Example: If you needed a dress alteration from our seamstress and it’s a hem we say $28.00 and up. Where a one layered maxi dress plane bottom no beading, no zippers, no vents may cost. If you then brought in a wedding gown with 3 layers, beading, rhinestones, and lots of designs, it would the and up portion of our pricing. Our expert seamstresses take plenty of care in all garment alterations we perform. From simple re-hem of a cuff to intricate wedding gown alterations. Each dress and wedding gown receives between 50+ to over 200+ pins to ensure the right length when you go to your next party. ***Above prices are all made up and do not reflect our actual pricing please visit for a free consultation to determine pricing of your next garment. This does not reflect a price quote. ARE GARMENT AND DRESS ALTERATIONS EXPENSIVE? This is a matter of personal perspective. We are all different, varying in shapes and sizes. Lets look at a few situations. We understand your purchase of the garment cost a certain value, but please never assume those cost of alterations should cost less. Manufactured made products are generally uniform and produced in a large tailoring factory, where as tailoring to have perfect size requires individualized attention. Anything from a button, a hem, to custom wear can vary in pricing and here is why. We are all a little different in size and clothing is always changing in styles from beaded, pleated, something simple, and something intricate. There is not a one price fits all and no expert seamstress should ever tell you so. **The following are all situations we have seen but the true value of the cost and bill are a reflection of perspective and not the true cost of our alteration prices. This page is not meant to quote pricing. Prices do vary on many garments. No seamstress should ever tell you an exact price over the phone or provide you with a price without seeing the garment or dress. As you may now understand the price of the dresses were irrelevant it’s the difficulty and time our expert seamstress take to pin and tailor to make you look and feel great in what you wear. The following are just some more examples if you understand the last idea please skip. HOW LONG DOES MY ALTERATIONS TAKE? It depends. We help our clients ask a lot of questions. It’s our belief that it would help demystify your experience with a good seamstress. At Cheung’s Tailor Alterations we pride ourselves in a quick turn around. We understand you brought in an article of clothing or fabric hoping to have it sooner than later. Even for those prepared may need last minute tailoring. If you haven’t already please read our expedited services check it out. Many seamstresses may hold your garment for either hours or week/s. It would depend on the type of services you seek from our seamstress. Our general service is one week to nine days and we wish to have dresses for at least weeks. Does that mean you can’t get it back tonight or tomorrow? Absolutely not. We provide expedited tailoring by our seamstresses daily. If you need it tomorrow we will do our best, if you need it this weekend we will do our best our quality and integrity in our work will be at it’s best. Accommodating to our services we provide a general time frame from our expert seamstress. During different seasons we perform different work. Generally during the winter times we perform lots of zippers a day from jackets, coats, and pants. Summer times a lot of summer garments and accessories. Whereas, during most months year round our seamstress perform a majority of dress tailoring. We will also do our best to get your next alterations performed when you need it. Especially for a special day such as your wedding, prom, or bridal party. ***Some items for larger zippers or materials out of our control such as needing to order materials for unique or custom garments may take longer than usual. Pick up time will be clarified during your visit. We do our best to accommodate every client and their schedule. Do you find yourself asking if seamstress appointments for tailoring are hard to get? Well they shouldn’t be and no one should tell you that. We would say 90% are walk-in clients and 10% are appointment based. Why appointment based? Because Cheung’s Tailor cares. Generally appointments are made for individuals who have 5+ suits needing alterations, Wedding Gown alterations, Bridal Dress alterations, Prom Dress Alterations, & Dress party alterations. We help accommodate clients at later hours than many other tailors. Having walk in services does not make your seamstress slow. It does mean we are efficient. We hundreds of clients coming in every week we serve each client as if we had one. Great service, great care, and expert tailoring for your garment. At Cheung’s Tailor Alterations we do our best to make sure our customers don’t wait too long. If you believe your alterations need fitting we advise you get it in soon. Only expert dress seamstresses can perform at a level where one fitting and one alteration is necessary. Do it right the first time around, that’s our mentality. Your time is important to us. 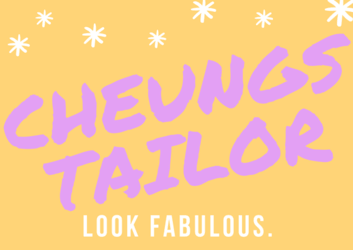 Though Cheung’s Tailor Alterations have only been online for less than 1 year (January 2016) we still are backed by over 60 years of combined seamstress and dress making experience. Far more than most tailors you will find in Minnesota. So the next time you come in for your dress alterations we’ll show you our book of over hundreds over references over the past couple years. If we forget please remind us, many clients may find a friend or two! So if your next seamstress tells you it’s hard to book an appointment, they may not be accommodating but we are give us a call or just walk in. Most of our suit and dress fittings take between half hour to an hour with over 50+ to 250+ pins per fitting for the perfect size and length. We do suggest future clients to give us a call ahead of time if they believe they would like an appointment during prom and wedding season. **Sometimes there may be a little wait for larger parties, since we are conveniently located in Rainbow Foods Strip Mall many clients can spends little time walking around other retailers we have some great stores and great people around us! Walk-in services is always welcome if concerned for fitting time please just call ahead. CAN I HAVE MY ALTERATIONS RUSHED? Absolutely! At Cheung’s Tailor alterations we are accommodating! If we’re here we will do our best to help with your alteration needs. A rush fee will be added to your final total – rush is also a cash only service. Our normal service is one week – some clothing alterations may require more time. Such as dress alterations and busier seasons, but no worries these items may also be expedited by our expert seamstresses in Minnesota. 1 hour, 2 hours, 4 hours, & 1 day up to 6 days. Rush alterations or expedited tailor is popular and many times our clients need it for various reasons. So if you’re running into the following situations, many we have witnessed we can help you every day before one week! 2 HOURS – New interview this afternoon, but I am drowning in my button down shirt. We provide expedited custom shirt tailoring. First impressions matter. At Cheung’s Tailor we service tailoring all over Minnesota. So if your interview is today we are able: Take in your shirt, shorten those sleeves, add new buttons, remove buttons, remake your tie, restitch a seam. 4 HOURS- My son’s play is evening, last night he tore open a seam. At Cheung’s Tailor Alteration we do unique alterations in Minnesota. From quilts to custom pajamas. So if you have something unique for a play and the seam on that costume could use some stitching. We are your MN Seamstress. 1 DAY – Tomorrow I have a date and my jeans could use some hemming. Jean hemming is our thing – so is everything else. We hope to be your local tailors around town and get those jeans shorten in no time. Well, in a day! 2 DAYS – I don’t know why my dog tore open my child’s backpack and ripped the zipper. Well don’t worry we speak zipper and a lot of other alterations in Minnesota. Lot of zippers can be repaired, we believe in education as well so every year we provide donations to various non-profits in Minnesota. So let’s get some zipper replacements on those backs by our tailors and get those kids zipping happily. 3 DAYS- Our children have their scout meetings this Wednesday and the new patches just came in, what should we do? Have no fear, Cheung’s Tailor is here. We have worked closely with all branches of the United States Armed Forces as well as, Boy’s Scouts & Girl’s Scouts Patches, VFW’s, Community Service Officers, Police Departments, Corporate businesses. We do a lot of patches, anything from small ones to large leather jacket patches. Get your tailoring done fast with our rush services. 4 DAYS – I have a wedding gown that I ordered online and it just doesn’t fit, over 3 sizes too big! [ Rush alterations on this happen often, so don’t worry] My wedding is in 4 day’s can you do it? Let us first start by saying congratulations! And yes we can do our best. Wedding is a very important day in most of our lives if not the most important. Our expert seamstress in Minnesota has performed thousands of dress alterations and we help consult on breaking down what is the most import needs. Wedding gown bustles, Wedding dress bust cups, Wedding Dress Hemming, Wedding Gown reconstruction, Bridal Alterations, Custom Bridesmaid Alterations, Prom Dress Alterations. 5 DAYS – I was ice fishing and burned a hole into my new snow suit because of my gas buddy. Is this repairable before we head up north this weekend? Minnesota is known for our cold winters and before you know it when we need it most it’s either not found or broken. Bring in your winter gear to have it repaired. Anything from jacket zipper replacements, snow suit patching, rain gear, dry suit repairs, down garment repairs, back packing tailoring, motorcycle suit repairs. 6 DAYS – My in laws are coming over for the holidays and my new curtains are way too long. I must have it that evening. Curtains, drapery, custom pillows, custom curtains etc. we can make sure the in laws won’t trip over them. Give us a call today. We’ll get your home accessories matching. 7 DAYS – I’m in no hurry, take your time I understand you’re busy. Take 10 day’s I’ll actually be out of Minnesota til the following week and I won’t be needing my clothing anytime soon. Whether it’s one hour up to 6 days, Cheung’s Tailor Alterations have been known to make sure we got you covered. Life happens. If its a patch tonight, hunting pants in two days, or meeting the in laws we’ll make you fashionable. No questions too big and no work too small. Stop on by consultations are always free. We hope new and old clients understand. We trust you, we really like you. But it’s unfortunate that some times when clients do prepay and not prepay for their tailoring or alterations they may not come come back. It’s weird, we know. Who would leave their new clothing paid and not come back? Their garments may be old or even new with the manufacturer price tag still attached! So again, we like everyone. Over time we make a huge effort to contact these clients who have paid or have unpaid alterations with us. Some have been here for over 5 years!